Skye Gravestones | Catherine Macqueen & Jennifer MacDougall. Catherine Macqueen & Jennifer MacDougall. 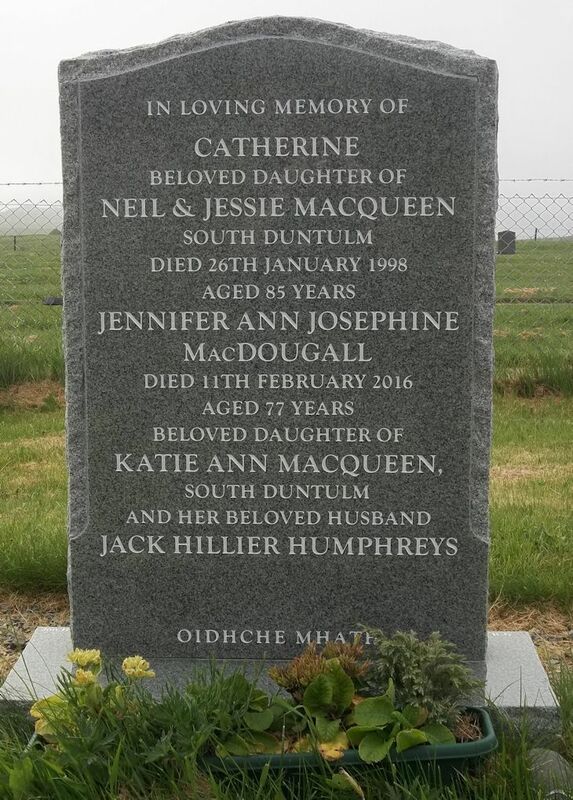 In loving memory of/CATHERINE/beloved daughter of/NEIL & JESSIE MACQUEEEN/South Duntulm/died 26th January 1998/aged 85 years/JENNIFER ANN JOSEPHINE/MacDOUGALL/died 11th February 2010/aged 77 years/beloved daughter of/KATIE ANN MACQUEEN/South Duntulm/and her beloved husband/JACK HILLIER HUMPHREYS.